SIZE: Size: Adult--1/4" to 3/4"
IDENTIFICATION: Adults are stout-bodied and dark brown to black, sometimes with yellow or beige markings. Wings are clear or smoky. They range in size from about as large as honey bees to about half as large. Large heads and highly polished black or metallic blue or green bodies. Sometimes bands of white hairs across the abdomen. BIOLOGY AND LIFE CYCLE: Solitary insect that uses pieces of leaves to line its nests in cavities in the ground, dead wood, hollow stems, snail shells, pipes, and other openings. 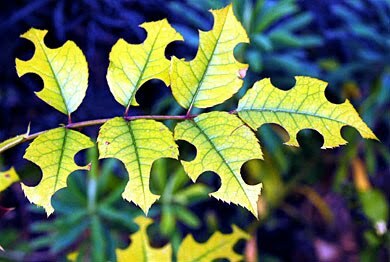 Leafcutters use their mandibles to cut neat circles or partial circles out of the edges of leaves to obtain material for their nests. You've probably seen this damage on your rose foliage. Complete metamorphosis. HABITAT: Many plants, but especially roses, hollies, and fruit trees. They are common everywhere. FEEDING HABITS: Pollen and nectar from many flowers. ECONOMIC IMPORTANCE: Important plant pollinators and should not be killed. Troublesome around machine shops because they will plug up any exposed pipes. Mechanics have learned to tape over the ends of pipes, fuel lines, and other openings. NATURAL CONTROL: Good biodiversity will keep them from being too abundant. Birds, praying mantids, and lizards. ORGANIC CONTROL: None needed in most cases--their damage is only cosmetic.